I wasn’t planning on doing weekly updates on my progress through GAPS Intro. I was going to just do a monthly update with my health update. But then I started writing my week 3 update and I realized that I had a ton to write about. So here’s a week 1 and 2 update, and then you will get weekly-ish updates from here out. Day One – Can I just say? BATCH COOK. If I hadn’t made up almost 5 gallons of soup before starting this, I don’t know what I would have done. I think about adding meat and chopping vegetables and broth and all the things every day and there’s just no way. With all that prepared soup, I just needed to heat, add extra fat and garlic, and eat. Boom. Plus, having so many prepared soups meant that there was variety. My husband wanted to kill be enough without having to eat the same soup at every meal. He was hungry all day. I, on the other hand, had no desire at all to eat. Day Two – I was on a round of metal detox (read more in my last update) when we started, and by this point I would normally be having stomach pains. I had a slight twinge this day, but that was it for the 4 day period. The liver and kidney support supplements I was taking, plus the detox of Intro must have really helped. I continued to not be hungry at all, but I never felt weak. Just my “normal” fatigue. I heard that with GAPS Intro you normally are super hungry, but I felt like I was barely eating. A pint of soup 3 times a day, and maybe a small bowl in the afternoon was it. DH continued to deteriorate emotionally, likely a combination of die off and lack of calories (he was eating even less than I). Days Three and Four – I moved DH to Stage Two of Intro early, on day 3. We both felt like he really needed something more, so he got egg yolks. I moved up to Stage 2 on day 4. We both began to get hungrier. The huge breakthrough was that DH’s brain fog lifted. He said he felt like himself for the first time in a long time. With just 3 days on GAPS Intro! How amazing is that?! Days Five, Six, and Seven – We ended the first week by adding in soft boiled eggs with no problem. While I used to hate eggs, especially yolks, I find that I love and crave these soft boiled eggs. We are eating non-GMO, pastured eggs, which is a higher quality than what we used to get. Accessing all those nutrients must be making a difference for me! However, we also ended the week with a lot of emotions. Lots of fighting and yelling, mostly about the diet. DH ate a cookie at work on day 6 and I totally melted down about it. But despite the emotional issues, we felt fine physically and DH has been feeling really sharp. I began to realize that I really needed to up my calories after – it is easy to not get enough when only consuming soup. Lots of animal fat is the solution! 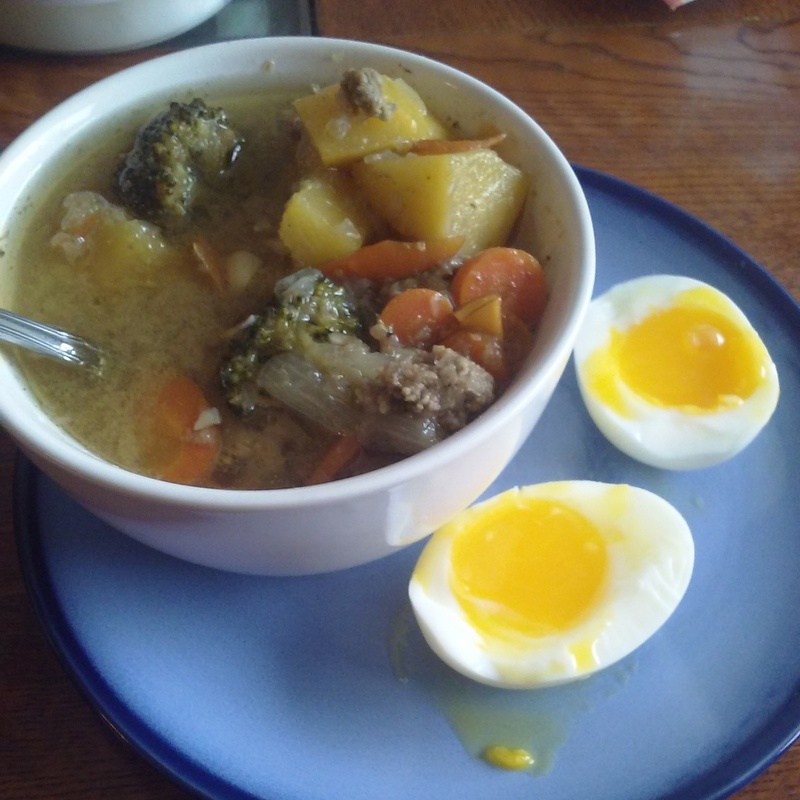 Beef and vegetable stew with a soft boiled egg – a delicious Stage 2 meal. By day 9, I was ready to break up with DH. This diet had made our relationship so toxic. He was grumpy constantly and I constantly felt unloved, unappreciated, and disrespected by him. He hadn’t been getting enough calories, and this likely affected that. He also just really struggled with feeling deprived. We had a long talk and decided to lighten the rules for him. He would be allowed to eat non-GAPS foods if 1. he made them himself, 2. he did not bring them into the house, 3. they only contained small amounts of honey, if any sugar, 4. when he was with me, even in public, he ate what I ate, 5. he still ate lots of soups and vegetables, and 6. if he noticed any brain fog or other symptoms, he would go back on Intro. This instantly made him happier. Even on the days that he didn’t eat anything different from me, he was helpful and appreciative. His 9 days on GAPS Intro, while hard, did show him the power that food can have on him and he strongly believes that this is something that I need for my own health. As of day 19 (when this was written), he is doing well on this modified diet and we are both much happier. During week two, I added in ghee successfully, started my period, and entered Stage Three. The ghee and Stage 3 avocado were both wonderful new options for healthy fats. I was (unintentionally) eating very low carb this week and was very tired. I also began to notice that my urine, which at the end of December was BRIGHT due to not absorbing my supplements properly was now back to a normal color. My body is healing! I also had not had any new blemishes in quite some time, the number one sign that I’m eating foods that are good for my body. I began to really appreciate detox bath. It may seen like a lot of work, but even if you just do a foot bath, do them! By the end of week 2, things were starting to feel better. The diet was feeling more sustainable and I could sense that this was going to make a huge difference in my health and my life. I look forward to seeing where this takes me! 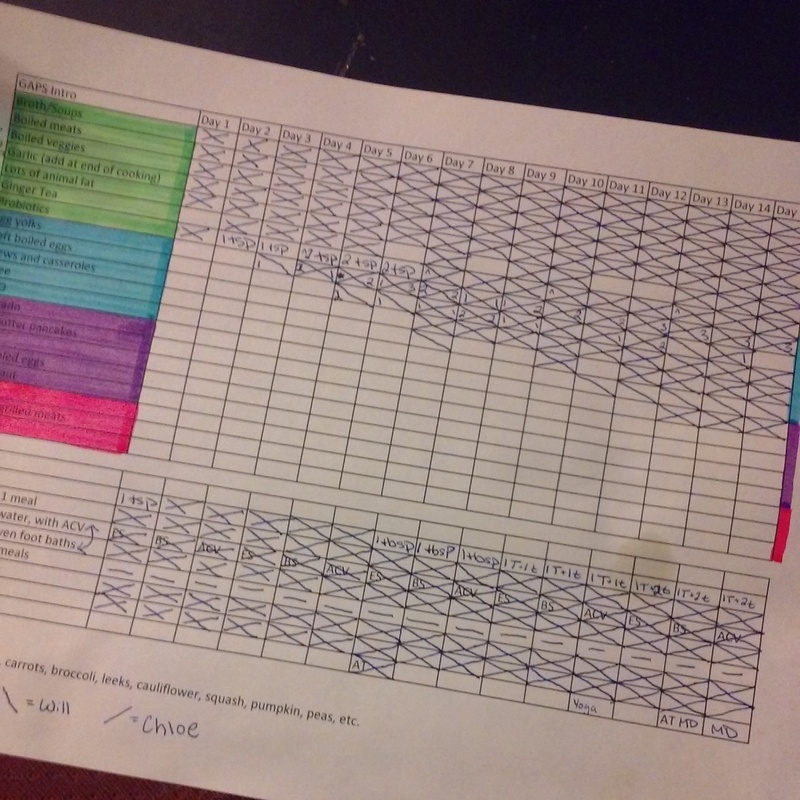 The spreadsheet that I used to keep track of what my husband and I were eating and adding in. Click on the image to download your own copy! So interesting, thanks for sharing! I’m struggling with the fact that I need to get back to clean eating, for health issues. It just feels like so much work and my husband also gets very grumpy on limited calories, so it’s tough. I remember feeling so incredibly amazing when eating 90% clean, and I want to get back that, it’s just such a huge mental and emotional effort so it’s hard to start. Your post has helped inspire me, though, so today is the day I go over the meal plan with DH, and all ‘bad’ foods are getting kicked out of the house tomorrow. Thanks again! It definitely is! I’m glad to hear that my writing is helping you get back on track. Good luck!